With NITE TRACK on board your boat or vehicle, you’ll have a crystal-clear view of what lies ahead, even in near-perfect darkness. NITE TRACK uses charge-coupled device (CDD) technology to provide a night-vision system that lets you see objects — and even word — clearly in the dark. Way more cost effective than X-Band Radar. Military / Civilian run dark / drive your vehicle or boat / vessel in total darkness and only you can see. Having NITE track on your boat means you never have to race the sunset home. You can stay out as late as you like, knowing that you’ll be able to come in safely, no matter how dark it gets. Affordable: NITE TRACK costs less than 3rdgeneration hand-held night vision devices and much less than remotely mounted thermal imagers. High Resolution: See more than just silhouettes. Nite Track™ reveals the details in your surroundings. Better full-time situational awareness compared to hand-held devices. Available in 2 color options, white or black. Nite Track Marine Sensor w/RAM mount attached. 25 Foot cable with termination leads and an attached video output cable. Housing:Anodized Aluminum/powder coated. Available in white or black. 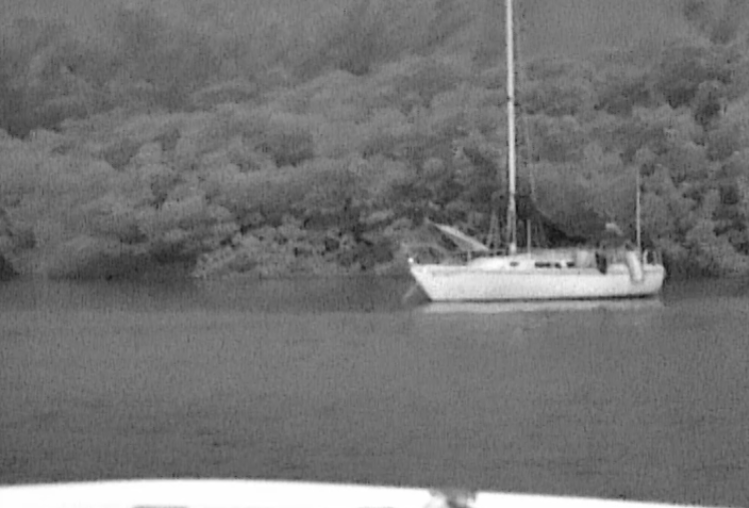 A Yacht, moored in total darkness, but with the Night Tracker, clearly visible. Marker beacons clearly visible with the Night Tracker, without Night Tracker, you will hit them. View of a jetty from the Night Tracker in total darkness.